At the recent Valencia test Colin Kolles showed me some pics of HRT’s new livery on his Blackberry, and a week later the team has issued them to the world. The new F111 has been designed in the UK by a team under Geoff Willis and Paul White, and uses a tub built by CarboTech, the Austrian company that has made chassis for Toro Rosso in the recent past, and is also involved with the McLaren road car. HRT hopes to have it ready to run by the Bahrain test. 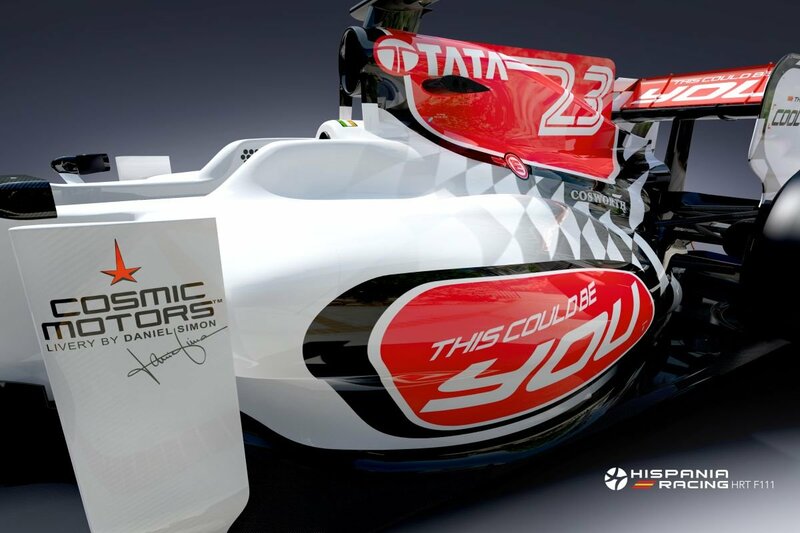 The car features a dramatic livery designed by Daniel Simon, who has worked for some leading manufacturers and is now working on Hollywood movies. The pics are also the first formal confirmation that Narain Karthikeyan’s personal backer Tata will also be seen on the car. Kolles says: “The F111 represents a significant step forward for Hispania Racing. We have made a big improvement for starting our second season in Formula 1 and what you see in our new car confirms Hispania Racing´s commitment to F1. Might not look out of place in INDY CAR , but, not in F1. No apparently they’ve gone for experience over youth and they’re bringing back Gianni Lavaggi !!! Don’t like it that much. Now that Renault are not going to run in their black & yellow, someone should use those colours. When I first saw the pic I thought “not another red and white livery”. A few years ago, most of the cars were red and white. Thankfully not any more. Also, it’s pretty obvious that apart from a couple of small Tata stickers, the rest of the car basically says “your logo here”. I’m waiting for the photoshop featuring a crash test dummy with ‘this could be you’ on it too ;). Seriously though the car itself looks better than last year and hopefully it’ll do some testing this time and bring in some sponsorship and that 2nd driver. I liked them better when they were all black – it was easy to spot them, and not to hurt your eyes like on this paint job. Regardless of final livery, hope to see some improvements in performance from HRT, they have much bigger fish to fry (reliability, weight, handling, more than 3sec-per-lap slower car…) than what will be colors of their cars. In the end, we all want to see 12 competitive teams and not just 4 or 5. Where they actually black? I thought it was sort of a dark grey, the F110 always reminded me of a child’s plastic model kit that had been hastily assembled and not painted yet. 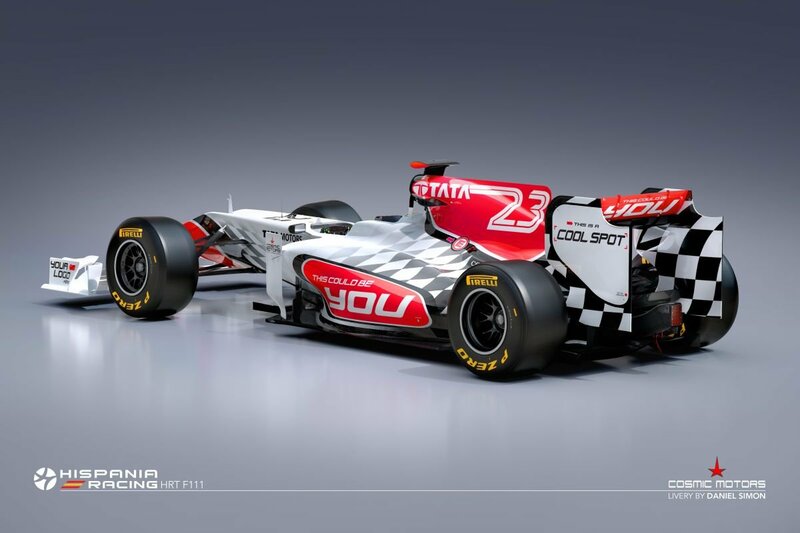 This does have a bit of the Indycar feel to it, it isn’t terrible just rather mundane, and hardly lives up to the hype we’ve heard about all the new artwork and designs for HRT. 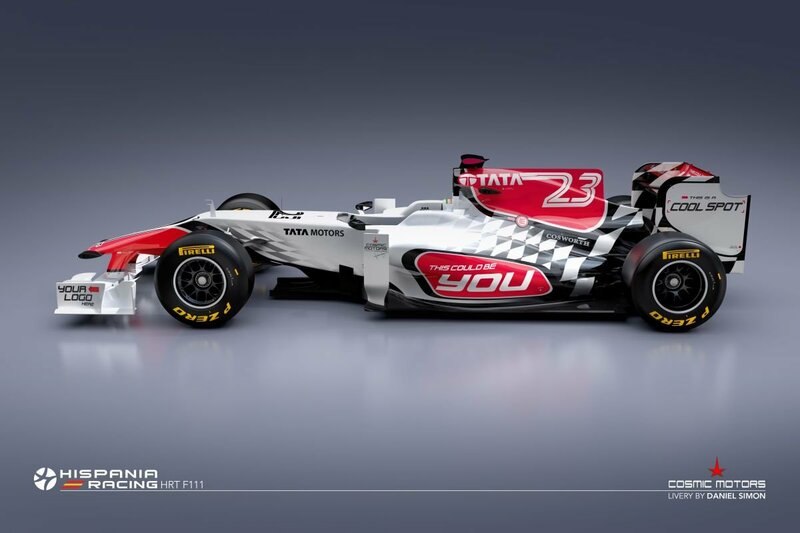 At least it’s a bit sexier than the Sauber! “This could be you.” Is that a come-on to potential sponsors, or a public service announcement for anyone considering starting their own Formula One team from scratch? Yes, much sexier than the Sauber. I have a very high regard for Peter, but he just doesn’t seem to have much concern for the esthetics of things does he? It’s a good looking car. If it exists.